Everyone is still reeling over the breakup of Kirk and Carly, which makes them think it could happen to them too. Could love survive outside of Paradise? The answer is doubtful but let's roll with it because it's time for Fantasy Suite dates AKA bone zone. Basically everyone's overnight date is the exact same, which involves having dinner and drinks but all at different hotels. 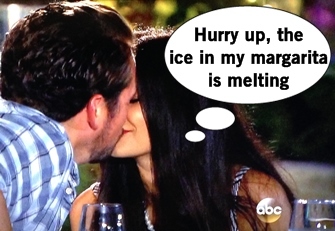 Nick and Samantha sip margaritas while having the same amount of chemistry as last night's date: zero. She barely kisses back and looks so uncomfortable, but hey let's move it to the bedroom. Justin and Cassandra are moving quickly since this show gave them a deadline after what, 48 hours together? Cassandra declines the Fantasy Suite since she is a single mom and wants to keep it appropriate and slow, though Justin wonders if it's because she's not interested. Ugh dude, listen to her. Tenley has a little more trepidation about everything given her recent heartbreaks, but Joshua would still like to see what a life could be like together outside of Paradise. They slip the ol' "Do Not Disturb" sign (in Spanish!) on their door. Jade worries she could end up like her bestie Carly, but that's not likely since Tanner tells Jade he loves her and she says she loves him too. They spend the night in the Fantasy Suite and wear the hotel robes, which I hope they stole afterwards. The couples return back from their lame-o final dates and get a speech from Chris Harrison about the final rose ceremony. The roses handed out this time mean you want a life together outside of Paradise. So everyone gets gussied up for the final rose ceremony and ponders over balconies what may happen. Except Tenley, who close-talks with Joshua about if their long-distance relationship is feasible. See, some people do actually use their minds AND hearts on this show! 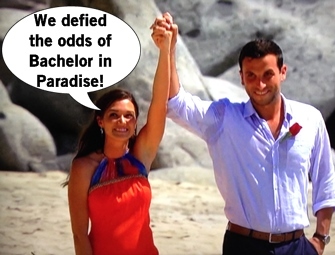 Justin and Cassandra are first at the rose ceremony podium and they both accept each others roses, looking to pursue this relationship for a more extended period than a long weekend in Mexico. Nick talks about how beautiful Samantha is and she says they were meant to be, so they happily exchange roses. Part of me is not surprised Samantha accepted a rose because I think she wants to save face, but I thought maybe she'd decline since she appears 40% invested in this. Tenley arrives at the podium looking absolutely stunning, while Joshua can't be bothered to tuck in his shirt. Joshua's speech is about how unexpected this love has been, but wants to try to pursue a relationship beyond this paid vacation. Tenley gets teary about Joshua restoring her ability to love, but him living in Idaho and their lifestyle difference is a major hindrance. While she wants to try, she knows it is the right thing to end this fling now. But all love is not lost! Paradise saved the best (and most predictable) for last. Jade expresses her love in a beautiful speech to Tanner, then he tells Jade at the rose ceremony he can't give her a rose... because he's giving her an engagement ring! More shocking: it's not a double halo ring! Horizontal emerald-cut vintage style ring, wow! And fine yes, I smiled and thought this was sweet because even if they dated like what a month they're pretty perfect together. See, you CAN find love in Paradise!